That bird must have gone to interior design school. What a fancy nest! Love all the birthday people. What a day! I have a VHS copy of "The Point"- do you remember it? Heh, heh! Those birds must have lived near a school dumpster and the teacher had just thrown out all the leftover crepe, tissue, and construction paper after a project. 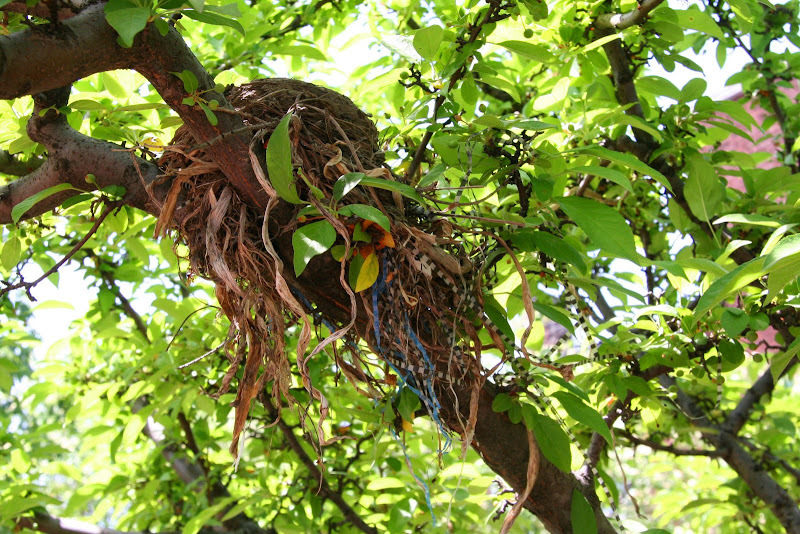 That's a pretty colorful nest. And it was good to hear Harry Nilsson again. Thanks! That is a seriously beautiful and baroque nest. If ever you get a view of the occupant, please let us know who lives there. Erik Erikson - amen to his words and thanks for the link. I didn't know the first thing about his childhood; most instructive. I've always liked his approach - the ego as performing the balancing act between the extremes. Which isn't anything like the middle-of-the-road blandness some folks label normalcy. I must check out that redwall cookbook. The names of some of the dishes inspire. cheers from a hot and muggy Graulhet, petite souris. The nest is an inspiration. Particularly timely, one of my guerrilla art pieces was removed, this encourages me to keep on building it (maybe choose a different location). That IS an amazing nest! I love "Everybody's Talkin' At Me." One of the best things about "Midnight Cowboy," which is saying a lot! Fantastic nest alright! We have a medium sized bird here called a 'Bower bird' because it builds a little ground bower out of twigs and decorates it lavishly with anything blue or shiny! I haven't read the Redwall series but you've given me an idea! My brand new nephew shares a birthday with some pretty cool people! Great commentary on people who really make a difference. harry Nilsson...I honest to God thought he died much earlier than 1994. I tend to think of him the way I do Jim Croce and Harry Chapin. The quote is so awesome and true. Kids deserve the best but they sure don't always get it.